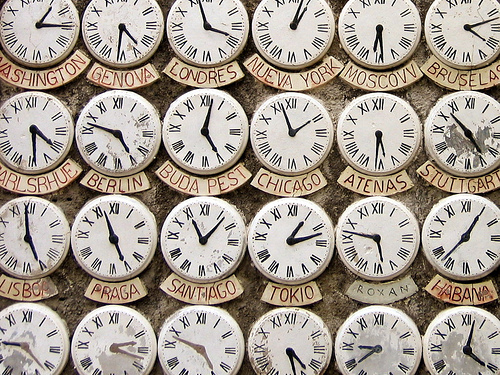 Technology might be collapsing distances and allowing folks spread across continents to work together, but no matter how good collaboration tools get, none of them can alter the course of the earth around the sun and eliminate the hassles of time zone differences. And anyone who has ever worked with a colleague half-a-world away knows of the occasional necessity of late night calls to bridge time differences, but besides knowing how to brew yourself a strong cup of coffee and operate your alarm clock, is there anything you can do to make working across many time zones less painful and more productive? Breaking the email chain. The email chain begins when, in asynchronous communication, the sender initiates a message, and the receiver on the other side of the globe asks for clarification. The original sender attempts to explain, but the receiver, still confused, sends another request for clarification. Meanwhile, an entire week has passed. Zoners stop this chain early by picking up the phone to clarify the message and move the task along. Carmel also points those confused about syncing up their schedules with distant coworkers to a handful of useful apps. Timeanddate.com, for example, offers everything from clocks giving you the current time just about anywhere to a time zone map and a list of world holidays – it’s cluttered but useful. World Time Buddy creates a dashboard that shows the time in multiple locations to help you plan meetings, while Every Time Zone does basically the same thing with a prettier but slightly harder to read slider mechanism. Another new, simple app along these lines is SameTimeAs, a dead simple solution dreamed up by Will Rodenbusch, one half of a globe trotting couple of location independents. As you might guess from the name, the gizmo simply tells you what time it is in location X when it is a given time in location Y.
Amidst all this talk of the hassles of timeshifting though, it’s important to note that many professionals who work across time zones report benefits as well as drawbacks. Jason Johnson, who co-founded BlueSprig with a technical team in China, has said that the massive time zone difference provides a great mix of collaborative overlap and uninterrupted periods of concentration. “I wake up about 6:00am. It’s around 10:00pm in China and generally they’re still working. I have a couple of hours overlap with them and then they go offline for eight hours. But then they come back online just about the time that my two-and-a-half-year old goes to bed and we can review things together. The really neat thing is, I will go to bed, say, 10 or 11:00pm. I will have shot over some requests or some feedback and they then have seven hours to work on those deliverables, so that when I get up at 6:00am I have an inbox full of messages,” he told GigaOM earlier this year. “The beauty of this is we operate 24 hours a day, and we have periods of being online at the same time to collaborate but we also have the benefit of these blocks of time where they can do what they do best without any interruption. During my workday I’m not getting all these emails. I can focus. Likewise, when they’re cranking away, I’m asleep and not bugging them. It works really well,” he said, putting a positive spin on timeshifting. Have you found ways to make timeshifting work for you or is it pretty much a nightmare in your experience? Image courtesy of Flickr user leoplus. I think various tools/apps can come in handy however the most critical part is the willingness on both the ends (onsite as well as offshore) to make it work, unless that desire to make it work is not there things can be little bit challenging. One of the ways to make it work is having overlaps of few hours as already mentioned in the post above. The coordination cost of not being in the same timezone is very large. for a company that is trying to innovate – the additional cycles imposed by the time differences makes iterations very painful. Peter Thiel argues that the reason one does a start up is because the coordination cost in a large organization is too high to allow for innovation. If you add a layer of coordination due to time difference – then innovation is almost impossible. Jessica, I agree that timeshifting can be a tremendous help if you use it right. Online support is one of the examples. In our case, our European office gets on the live chat around 4am and then passes it to the Canadian team, which finishes around 6pm. This gives us almost 14 hours of non-stop online presence.